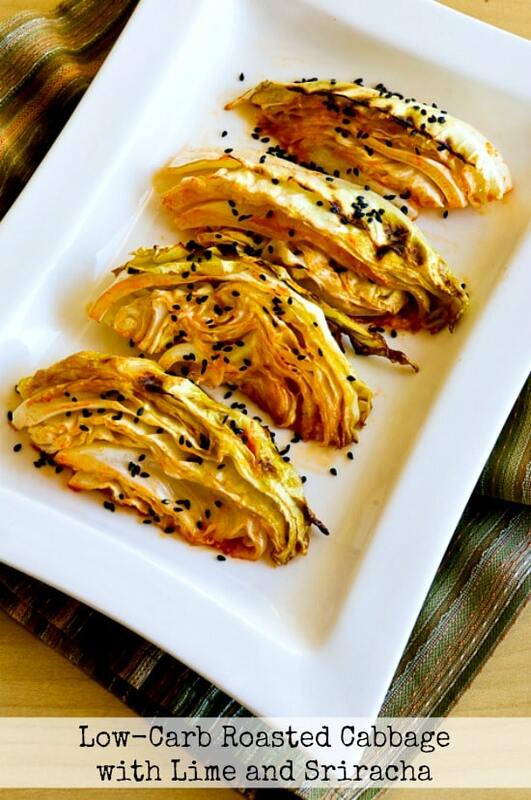 My love affair with cabbage continues with this Low-Carb Roasted Cabbage with Lime and Sriracha and this delicious recipe is low-carb, Keto, low-glycemic, gluten-free, dairy-free, South Beach Diet friendly, meatless, and can even be Paleo if you sub Sriracha for an approved hot sauce! Use the Diet-Type Index to find more recipes like this one. Click here to PIN Low-Carb Roasted Cabbage with Lime and Sriracha! I’ve been a cabbage fan for a long time, but I think the beginnings of my love affair with cabbage probably were stirred by a bacon and cabbage salad my mom used to make. I’d clean my plate when we had that for dinner, and not just because of the bacon either! As an adult I’ve continued to love cabbage both raw and cooked, not only for the flavor but also because it’s such an inexpensive, nutritious, and diet-friendly ingredient. I’ve posted a lot of favorite recipes featuring cabbage through the years, and this Low-Carb Roasted Cabbage with Lime and Sriracha is definitely a riff on my Low-Carb Roasted Cabbage with Lemon, a recipe that’s been hugely popular on the blog. 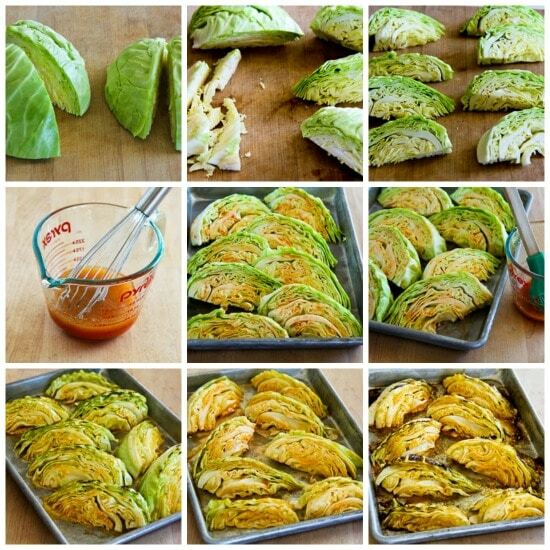 If you like lime and Sriracha Sauce, take a chance on the cabbage and I bet you’ll like this one as much as I did! I will say that this was not nearly as good re-heated, so even though I used a whole head of cabbage in the recipe, when I make it again I would make only as much as was going to be eaten at that meal. Just make it for dinner two nights in a row if you’re only cooking for a few people! The only thing difficult about this recipe is keeping the cabbage wedges together when you turn them to brush on the lime-Sriracha-oil mixture and to cook the other side, and you’ll have better luck if you start out with a compact, firm head of cabbage. Cut the cabbage into 4 same-size pieces. Remove any outer leaves that are bruised or discolored. Then trim the inner core part from each piece and discard the core. (Edit: The same day I posted this I heard from a reader named Fred who kept the core attached and trimmed it off after he cooked the cabbage. He reported this made it much easier to turn, so in the future I am switching to Fred’s method on this!) Carefully cut each piece in half so you have 8 same-size pieces. Whisk together the oil, lime juice, and Sriracha Sauce. Spray a small baking sheet with non-stick spray or oil and arrange the cabbage wedges so they aren’t touching; then brush each with a generous coating of the mixture. Carefully turn the cabbage pieces over and brush the other side, saving some of the mixture to brush again when you turn the cabbage. Roast at 450F/230C for 15-17 minutes, or just until the edges are starting to brown. Then use a large turner to carefully turn the cabbage and brush the other side again with the Lime-Sriracha-Oil mixture. Continue to roast for 15-17 minutes more, or until the other side is starting to lightly brown. Serve hot, with more lime to squeeze on at the table if desired! I’d always like extra lime on this! Make it a Meal: This would be a nice side dish for Spicy Vegan Peanut Butter Tofu or Low-Carb Herb Marinated Air Fryer (or Oven) Chicken Thighs. My love affair with cabbage continues with this Low-Carb Roasted Cabbage with Lime and Sriracha and this delicious recipe is a tasty low-carb lunch! Cut the cabbage into four same-size pieces and remove any outer leaves that are discolored or wilted. Carefully cut each piece in half to make 8 same-size wedges. Place each piece of cabbage on the baking sheet, arranging so the wedges are not touching each other. Whisk together the oil, lime juice, Sriracha Sauce , and Vege-Sal (or salt) to make the glazing mixture; then brush the mixture over the cabbage with a pastry brush. Carefully turn each piece of cabbage over and brush the other side, reserving some liquid to brush again when you turn the cabbage after it’s roasted on one side. Roast in the center of the oven for 15-17 minutes, or until the edges of the cabbage are starting to get brown. Use a large turner to carefully turn the hot cabbage pieces, then brush again with the remaining lime-Sriracha-oil mixture. Roast for 15-17 minutes more, or until the second side is starting to brown. Remove from oven, place on serving dish, and sprinkle with sesame seeds if using. Recipe created by Kalyn, inspired by Roasted Cabbage with Lemon. 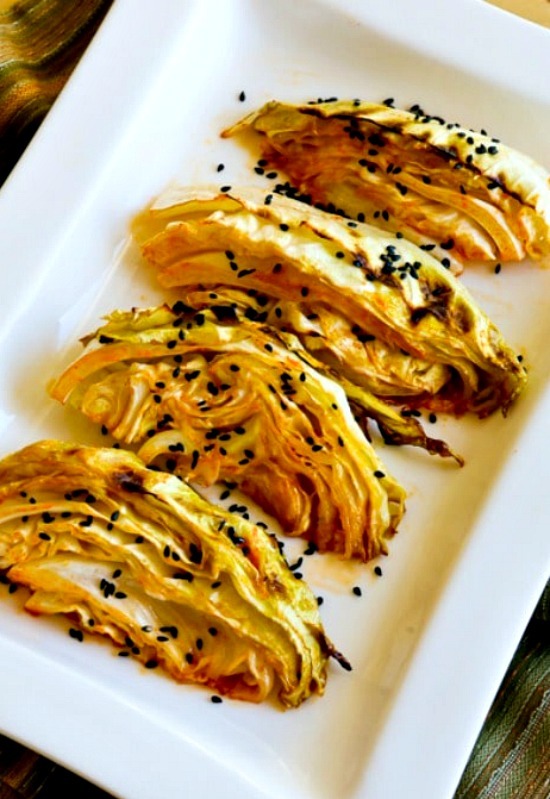 I’m happy I love cabbage, because it’s a wonderfully low-carb ingredient, and this Low-Carb Roasted Cabbage with Lime and Sriracha is suitable for any phase of the South Beach Diet as well as other low-carb eating plans.